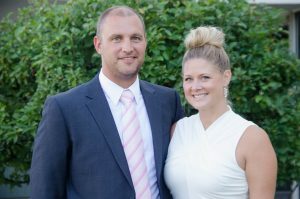 NOVI, Mich.—Darrin and Barbara Siemen of Harbor Beach, Michigan, were selected as the state winning 2016 Michigan Milk Producers Association (MMPA) Outstanding Young Dairy Cooperators (OYDC). As the state winning cooperators, Darrin and Barbara will represent MMPA at various industry and association activities. David and Gretchen Tolan of Ossineke, Michigan, were selected as the runner-up cooperators. Selection of the OYDC is based on the applicant’s farming operations, farm-related and community activities and demonstrated leadership abilities. Darrin and Barbara own Prime Land Farm, a dairy farm five miles west of Lake Huron in Michigan’s Thumb region. The farm operates 1,500 acres and milks 320 cows using an automated milking system, commonly known as robotic milkers. The couple is a member of MMPA’s Huron Local in District 8. “Prime Land Farm is a progressive and diverse centennial family farm which strives to be profitable for the next generation, sustainable in all stewardship practices, and serve its community and agriculture at large,” the Siemens described. The couple met while attending Michigan State University where Darrin obtained a degree in food industry management and agribusiness. Barbara graduated with a degree in English and later received a teaching certificate from Saginaw Valley State University. The Seimens are involved with MMPA at the local level, with Darrin serving as a local delegate and Barbara as a dairy communicator. They both also hold leadership positions on the Huron County Farm Bureau. Barbara runs a blog, The Chick Wire, a network of women that shares values, cultivates understanding and inspires without judgement. The Siemens were one of 10 cooperators invited to the annual OYDC Conference held Aug. 18-19. The couple was selected to participate in the program earlier this year by fellow dairy farmers in their local and the MMPA State Nominating Committee. The state OYDC Conference, held at MMPA headquarters in Novi, provides participants with information about milk marketing activities, cooperatives, milk testing procedures and other current events within the dairy industry. The program has been held annually the past 66 years. This year’s program featured the Top Ten OYDCs selected by the State Nominating Committee from a pool of applicants nominated by their local. All Top 10 MMPA OYDCs will be officially recognized at MMPA’s 101st Annual Meeting to be held March 23, 2017 in Lansing, Michigan.